Every tap, swipe, pinch that happens on your mobile app (or doesn’t happen) determines its overall usability. From swiping up to access a navigation menu or tapping to favorite an item, gestures are the essential bridge between your end user and your app. If your users encounter the slightest bit of friction with your in-app gestures, they are highly likely to quit your app and potentially never return. Therefore it is super critical that you are tracking the performance of your in-app gestures accurately and effectively. So how do you do this? Well first it starts with which type of app analytics you are using. Quantitative, traditional analytics that supplies you with numerical data, is great for providing an introduction of gesture usage within your app, but it doesn’t allow you to actually visualize and deeply examine these key user inputs. For example, traditional analytics might tell you that only 18% of your users are tapping the ‘login’ button, but you will have no idea as to the exact “whys” behind that percentage. At the end of the day, you need analytics that enable you to see the full picture regarding the usability of your gestures. This is where touch heatmaps take center stage. 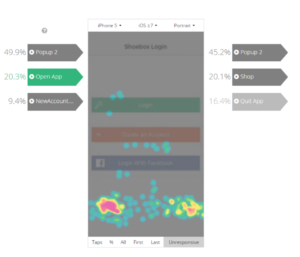 Touch heatmaps are distinct, visual overlays based on cumulative gesture data from your mobile app’s users. Touch heatmaps typically utilize a gradient from blue to red- with red representing the highest concentration of touch input and blue representing the lowest. Why do they matter for mobile? 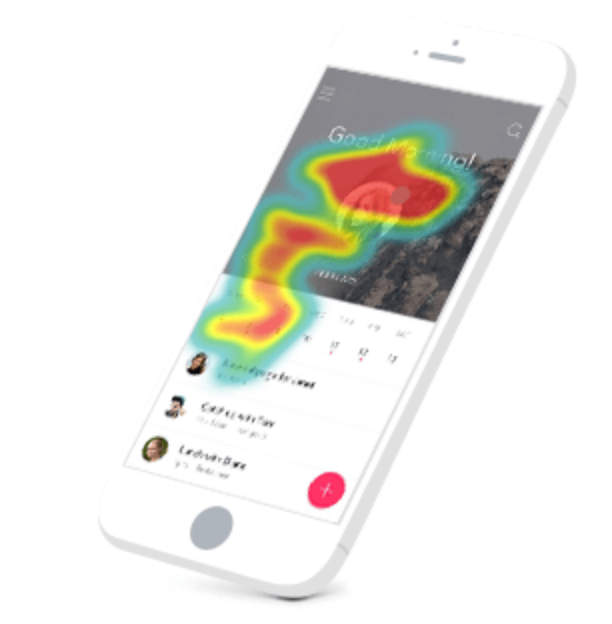 A powerful qualitative tool, touch heatmaps enable you to actually see where your users are tapping and which parts of your UI are receiving the most and least amounts of attention. These actionable, aggregate insights allow you to assess multiple aspects of your gestures and how they affect your apps overall user experience. You can also examine touch heatmaps across different versions and resolutions of your app to gain actionable insights on performance and compare usability. On top of that, touch heatmaps can also help you determine which real-estate areas of your screen are best for ad placement. To help you glean the most information from your touch heatmap data, it’s important to know which gesture KPIs are worth zoning in on and measuring. Below we have provided a quick breakdown of some of the most notable gesture KPIs that can easily be examined with your touch heatmaps. Is there a gesture function that you’ve deployed that is utilized less than expected compared to other gestures? This could signify gesturization that is not completely intuitive or not even necessary. If it’s lacking intuitiveness, you could consider incorporating a tip or a visual queue to drive usage, and then further assess the effects of this initiative again via the touch heatmaps. This KPI can help your team pinpoint the type of gestures users prefer to utilize within your app. If these gestures are the intended inputs for a particular screen, then it can help validate your gesture implementation. Assessing and replicating this gesture(s) pattern throughout the app environment (where relevant) could be a wise move. Alternatively, if users are performing a gesture that is not intended to be a “most common gesture”, this can reveal that users might be confused by your app’s UI. This gesture metric can help you identify the natural impulses of your users and the types of gestures most users attempt at first glance. Again, if this gesture is not the intended one, then this can signify a usability issue or faulty UI. Example of a “First gesture” touch heatmap with Appsee. You can see on the settings screen that there are a fair amount of initial gestures on the sign out button and on a blank part of the screen without any button or function. This metric is interesting in that it can help you examine the most valuable gestures in terms of the users’ journey/progress within the app. 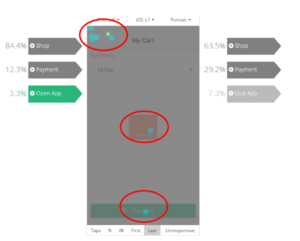 For example, if you have an eCommerce app, you would expect (and hope) that when users arrive at the “My Cart” screen that their last gesture would be tapping the “pay now” button in order to ultimately convert. If users are not tapping the “pay now” button as their last gesture, this can illuminate friction within the user journey and should prompt you to optimize your CTA button. Example of a “Last gesture” touch heatmap with Appsee. This is one of the most crucial gesture metrics that you can truly only measure via touch heatmaps. An unresponsive gesture, especially one that goes unnoticed, can have grave effects on your UX and retention rates. Unresponsive gestures can indicate a bug or a design flaw within your UI. For your users, they can cause major frustration and diminish trust in your product. 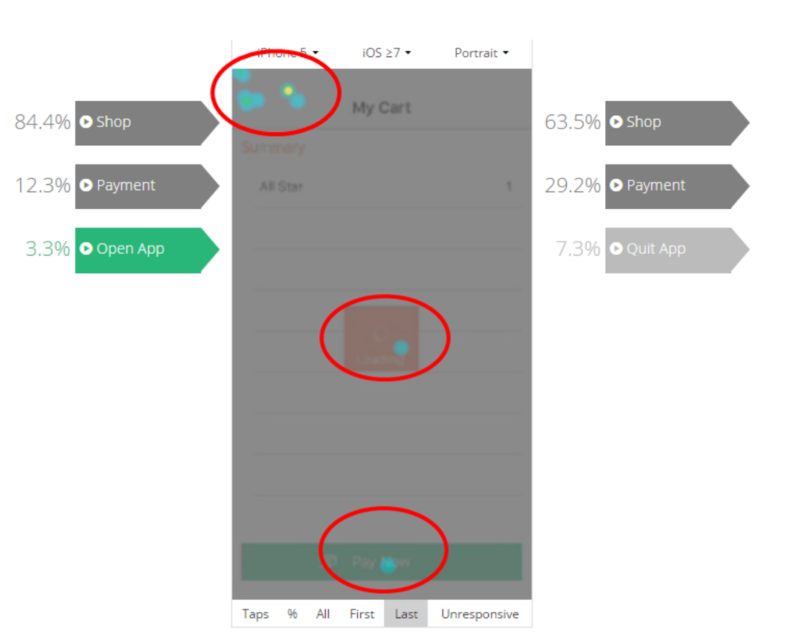 Take a look at the unresponsive gesture touch heatmap below of the eCommerce app Shoebox (demo app). You can see that a lot of users have tried to swipe right at the bottom of the ‘login’ screen in hopes to be able to bypass the specific screen and continue their journey. Ultimately, users have expectations for how they should be able to navigate and they are not being met in this case, thus generating major friction in the user experience. This actionable insight from this specific touch heatmap, should prompt your team to add an additional navigation button that caters to this revealed user behavior and allows users to start shopping right away. 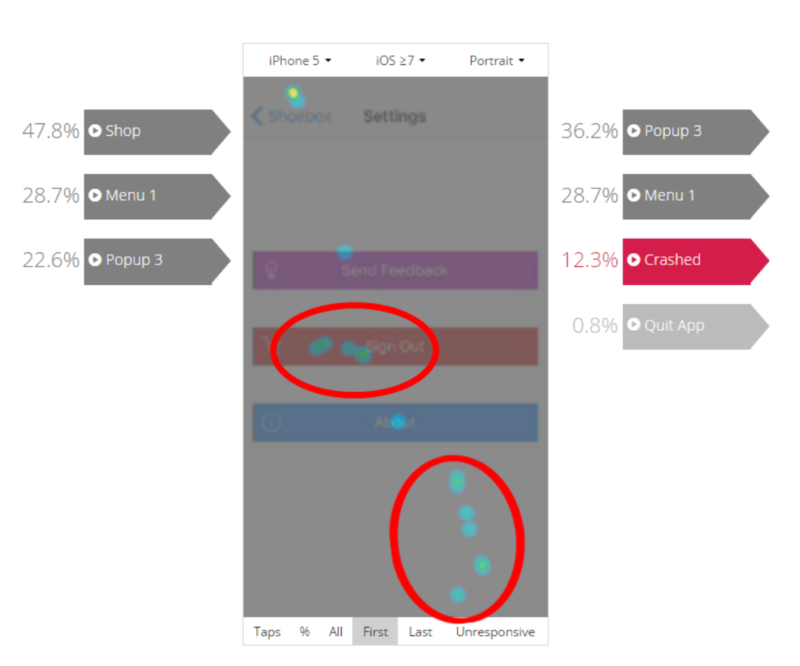 Example of Appsee’s touch heatmap for unresponsive gestures. Your in-app gestures might be small physically, but their effect on your app’s usability and overall UX can be quite significant. The slightest gesture that is counterintuitive for users, not aligned with their gesture preferences, or unresponsive, can greatly damage your engagement and retention rates. Thus, you need to make sure that you equip yourself with robust visual analysis tools, like touch heatmaps, in order to successfully track, understand, optimize, and troubleshoot this crucial aspect of your app. Appsee is a mobile analytics platform that offers a unique and powerful analytics solution, enabling you to optimize the user experience in your app. Hannah is the Content Marketing Manager at Appsee . A UX and mobile app enthusiast, she has a great affinity for discovering and sharing unique insights and resources with the mobile tech community. Hannah also loves photojournalism, classic rock, and pretending that she's the only one with a "foodie" Instagram account. You can follow Hannah on Twitter @HannahLevenson.